This is the first printing of the first USA edition of EIGER THE VERTICAL ARENA by Daniel Anker. This book was published in Seattle by The Mountaineers in 2000. The book measures 247mm tall x 176mm, and has 224 pages, 113 color & 67 b/w photos, 3 maps, several sketches, chronology, good bibliography. This book incorporates the writings of 17 Eiger climbers inserted into a very interesting and detailed history by Anker of climbing on the Eigerwand. It includes excellent historical photos as well as the best account of the modern hard climbs on the face. It also addresses nationalism and other controversial topics regarding ascents that are completely skipped or barely mentioned in other accounts. CONDITION: Original navy boards with silver lettering spine. 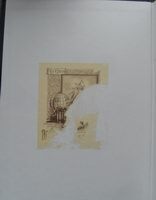 The book has a previous owner bookplate on the front pastedown that has been partially pulled off, otherwise no previous owner marks or writing, no foxing, basically like-new condition. The dust jacket has no chips, no tears, very minor edge wear at corner tips. Price: $120.